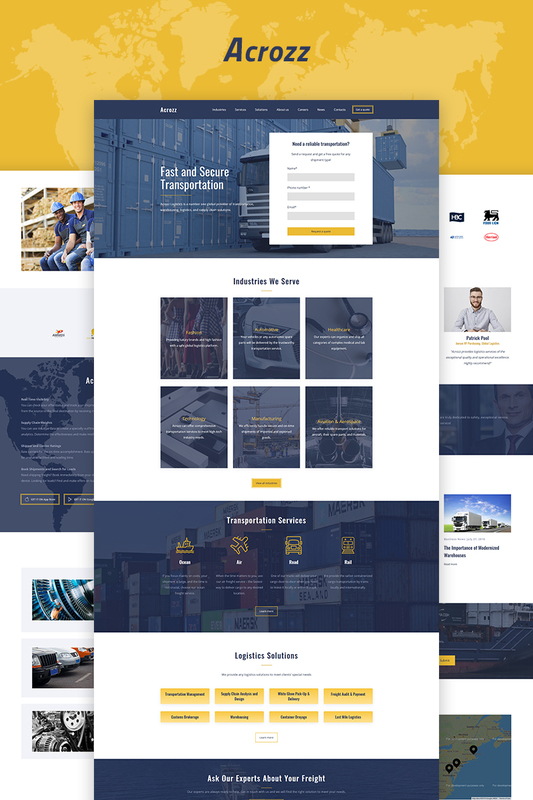 Weblium Logistics Website Template will work well for transportation and logistics companies that are willing to create a website for free. Our designers have analyzed 100+ websites typical for the transportation industry to outline 10 pages and 56 blocks that will meet your most daring requirements. All you have to do is change a few website blocks and elements, fill them with your texts and visuals, and publish the website. On average, it takes less than an hour. Weblium site building technology will let you add, remove, and manage any website elements without coding. Most settings can be changed by toggling them on and off. Sign up today for free and start attracting online traffic from Day 1. You will be able to use all the features of Weblium Website Editor to understand whether it suits you well. Thanks to built-in AI Design Supervisor, your logistics website design will look consistent despite the changes you make. Plus, youâ€™ll be able to alter design elements (like fonts or color palettes) in one click with Smart UI Kit. To crown it all, your website made with Weblium website builder will load fast (above 90-100 in Google PageSpeed Insights) and look great on any device by default. Donâ€™t hesitate. Just try and youâ€™ll love it!